Older and rural homes have special insulation needs because of building design and structure. Adding insulation into these homes is not always an easy matter, especially where there are thin plaster walls, which could potentially contain asbestos. If there is asbestos inside your home, you will need to begin the process to remove it. Extra precautions must take place to ensure there is no cross contamination into the rest of the house during the removal process. In addition to concerns with asbestos, insulating older and rural homes may require upgrading electrical wires as well as constructing new walls and frames. If you live in the Halton/Peel region and are looking to insulate an older or rural home, we can help you determine the best insulation application method for your building design and structure. If you live in a newer home or condo in this region and notice drafty areas or sweaty windows, the culprit could be air leakage and heat loss. 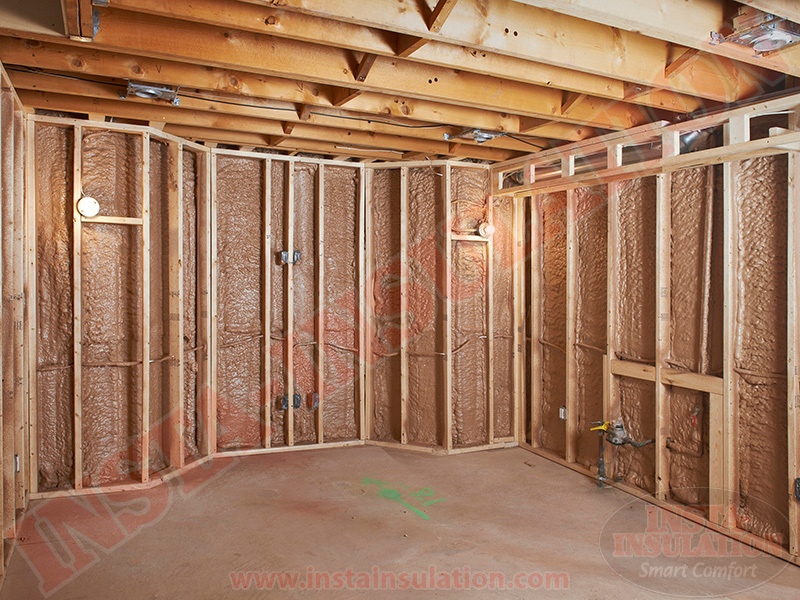 Insta-Insulation offers free insulation consultations in the Halton-Peel region. Please reach out to us today at 1-800-668-0311 or info@instainsulation.com. Regardless of the age of your home or condo, we have expertise in everything insulation, which is why we offer a variety of insulation services. For over 25 years, home owners and contractors have trusted us with their insulation needs, including installs, upgrades, and removals. Not all insulation applications are the same, and we have the expertise to know when and how to use each system. One way to combat mold, animal contaminants, and high energy bills is to install new insulation in your attic. There are traditional and modern approaches to insulation application. A modern approach includes the hot roof system in which two pounds of medium density spray foam is used to seal and insulate the entire underside of the attic roof. At Insta-Insulation, our spray foam is already compliant with environmental regulations coming into effect in 2020. If you live in an older home and require a more traditional method to tighten your attic deck, we will follow a strict process to ensure it is done properly. This involves completely removing all existing insulation in your attic before installing a layer of spray foam and topping it off with blown-in cellulose. Insta-Installation does not take the easy route when it comes to attic insulation upgrades because doing it the easy way can damage your home. Certain aspects in your home must be inspected prior to insulating the attic because failure to do so could lead to moisture issues, such as mold. Wiring, ventilation, and roof slope are only a few of the factors that must be addressed to ensure your home attic upgrade is done right. Insta-Insulation wants to help fix problems, not be the cause of new ones. At Insta-Insulation, we prefer to use blown cellulose in retrofit wall and attic upgrades. In addition to being cost-effective, it performs well in areas with irregular surfaces and resists air flow better than fiberglass. As temperature fluctuates wildly outside, the efficacy of the insulation does not waver. At Insta-Insulation, we use Climatizer Plus; this cellulose is 85% recycled, shredded newsprint that has been specially treated with flame retardant, which has the dual purpose of controlling fire while minimizing the potential for mold formation. This cellulose has been fiberized, which means each individual wood fiber has been separated to allow for greater coverage and performance. To date, one of the best options to increase energy efficiency in your home is spray foam insulation. This system can be used to seal and insulate floors, attics, walls, ceilings, and flat roofs. In addition to keeping your home comfortable, spray foam will also secure a high return on investment, including increasing your energy savings up to 20% and raising the resale value of your home. Spray foam is a high-performance insulation because its thermal and air control properties are unrivaled. Fiberglass cannot offer near the same amount of protection as traditional pink fiberglass. There are many reasons why you may need to remove existing insulation from your home; for instance, insulation which has been saturated with water can lead to damage, including mold. In this scenario, it is absolutely necessary to hire professionals who can safely remove these unhealthy spores. Another reason to remove existing insulation is if critters break into your home and nest in your attic; they will urinate and defecate all over the place. Even if the critters are removed, your attic insulation would more than likely still be contaminated. Other common reasons that necessitate insulation removal include smoke damage, electrical work, and structural renovation. Additionally, if you have vermiculite insulation, it may contain asbestos, and the insulation removal process in this case requires that strict safety precautions are followed. At Insta-Insulation, we have the proper equipment to safely remove and extricate contaminated insulation. Please note, we will only remove vermiculite insulation if the asbestos level is equal to or below .5%. For over six years, Bryan Baeumler has trusted us enough to use our insulation removal service on many of his TV shows, including House of Bryan. Mold can damage more than the structural integrity of your home. It has the potential to cause health problems, especially for individuals who already have asthma or allergies. Because of this, Insta-Insulation promotes regular attic inspections and spray foam systems as these are preventative not reactive measures to mold. If you do notice mold in your home, contact us immediately. In most cases, the mold removal process takes three to four days. Insta-Panels is an excellent option by which to improve heat retention and home comfort without breaking the bank. With the efficacy of sprayed-on foam without the mess or hassle, Insta-Panels are R-11 rigid polyurethane foam panels sandwiched between steel or fiberglass. The two main uses for Insta-Panels are radiant floor heating and under slab insulation, where concrete is poured on top of the installed insulated panels. With our insulated panel system, you will have no need to worry about condensation migration or mold formation. Snowmobiles and tractors are too expensive to leave exposed to the elements. More so, protecting your investments from rust and premature aging is as easy as storing them in an insulated shed, where condensation is stopped before it can even form. With its double steel construction and polyurethane foam panel system, you can rest assured that your contents will be safe and sound when stored in an Insta-Shed. If you live in Halton-Peel and have any questions regarding any of our listed services, please contact us toll free at 1-800-668-0311. You can also reach us by e-mail.